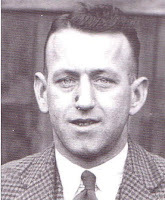 Representative Honours: Ireland: 4 Caps (1931-1933), Junior. Irish League: 2 Caps (1927-1931); Welsh League: 1 Cap (1935). Club Honours: (with Queen's Island) Irish League Runner-Up 1926/27. A "fast and clever" winger, "tricky" and "tenacious", Hughie Blair was mainly a provider of goalscoring opportunities for his teammates. He did however manage an impressive 19 strikes in 1926/27 as Queen's Island finished runners-up to Belfast Celtic in the race for the Irish League title. His feats included all four in a 4-3 League win over Newry Town and a hattrick against Glentoran. During this season, Blair was selected for the Irish League side that faced the Free State League at Windsor Park. His write-up in the Ireland's Saturday Night prior to the 1-1 draw described him as: "speedy, good ball control, a boot that is accurate and strong, quick to accept goal-scoring opportunities and intelligent enough to position himself so that these gifts may arrive regularly." Previously Blair had been an outside-right with Ballyclare Comrades from August 1923 to May 1924 and represented the Combination League in a win over the Leinster Senior League in Dublin and also won Junior international recognition against Wales. He then appears to have been away from an established team for three years prior to playing with Armagh Comrades at the opening of the 1926/27 season and joining the Island shortly thereafter. Blair signed with Portadown on 20 August 1927 and in five seasons scored over forty goals, including five in a match against Queen's Island. In February 1928 he was selected for a quickly assembled Ireland team, featuring almost exclusively Irish League players, for a match against France at the Buffalo Stadium in Paris. He added two further caps to his collection while with the Ports. He also made his second appearance for the Irish League in a 3-2 win over the Scottish League at Windsor Park in October 1931 as outside-right. On 14 May 1932 Blair moved to the Football League with Swansea Town. With his move to Wales came further representative honours in the shape of a fourth and final Irish cap and an appearance for the Welsh League against the Irish Free State League at Dalymount Park on 18 March 1935. His best season with the Swans was his first, playing mainly from outside-right he missed just two games, scored nine goals and set-up many more. He lost his place at Vetch Field during the 1933/34 campaign during which he also took to the field at inside-left and was a bit-part player by the time of his departure for Division Three (South) Millwall. After a largely unproductive season at the Den, Blair returned to Ireland for a month-long spell at Ballymena United. Later he settled in Liverpool where he was a schoolteacher. Additional details by George Glass and Jim Murphy. As far as I know there were no caps awarded for the France game in 1928. Gives me a thought though, I may have to do something on the history of 'Caps'!